On the morning of November 18th, we woke up in Nazca and got an early start. We skipped the famous Nazca Lines in favor of moving quickly down the road. Most of the Pan-American Highway we drove the previous evening was inland, so we got treated to a new environment in the morning: sand dunes. This is the only “classic” dune type photo we were able to get. I’m not really sure how it came out sharp, I shot it out the side window of the car. A typical village along this stretch of the PanAm. Trucks, tuk-tuks (often with logos like the Batman and WB below for some reason), and frequent villages. 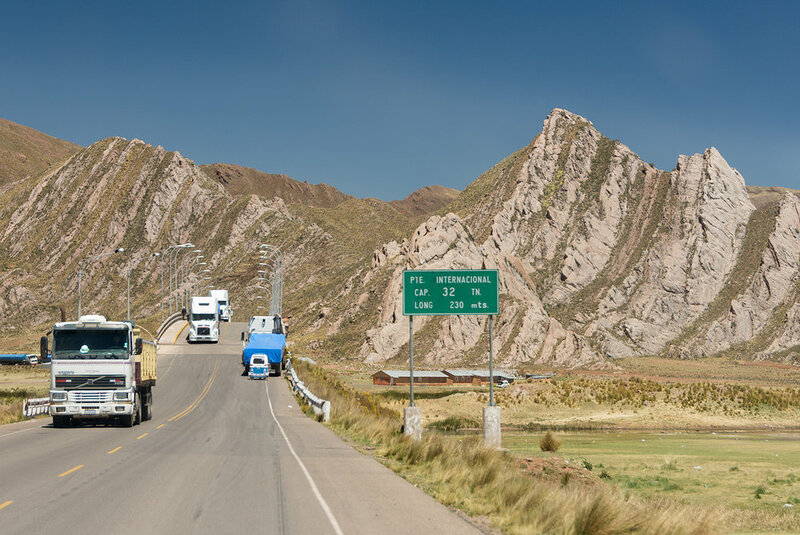 This highway is the largest truck route in South America and it showed with the level of traffic we’d sometimes encounter. The PanAm parallels the ocean for a few hundred miles. The scenery is very good, with the coastal range rising into the clouds to the left and the ocean to the right, but we also had to deal with a few problems. 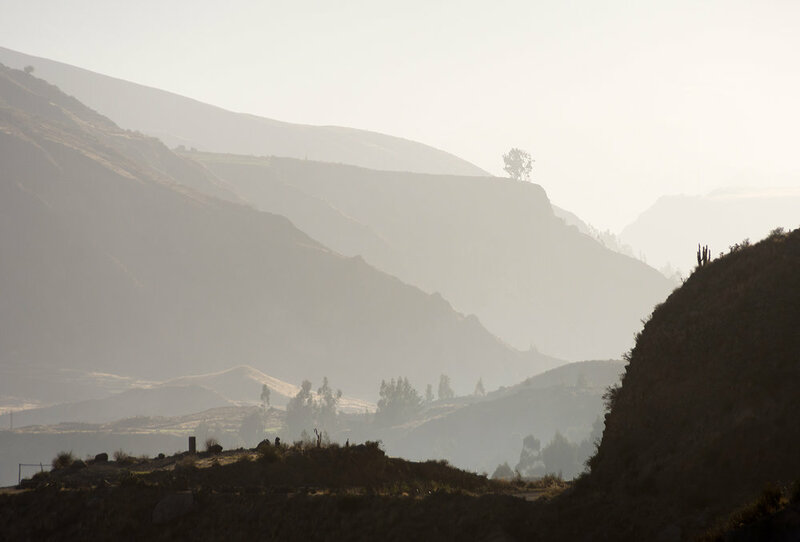 The primary issue was Peru’s marine layer, which I had previously met in Lima. This made most photos severely low on contrast, and while editing that I’ve lost some detail. Still, I promised that this series would be “warts and all,” so in this part the warts are particularly visible. The other problem was that our rental car, which we hired in La Paz, was not tuned to run at sea level. This was our only extended run below 2000 feet during the trip (and the only run below 7000 feet for nearly two weeks), and the car was really down on its already limited power. When a car is tuned to run at 13000 feet’s worth of oxygen, the soupy air at sea level causes some issues. These two photos are what a typical stretch of the PanAm in this area looks like. Along the cliffs, winding up the hills and back down, in and out of the marine layer. Not pictured are the endless slow trucks, which often take “racing lines” through the curves, making the already difficult task of passing them nearly impossible. However, when there were breaks between cars, we were treated to some excellent views (despite the sub-optimal light). Finally, the reason why we rented a 1995 Nissan Patrol! About 60 miles to the west of Arequipa, we turned due north and drove into the wilderness. This was our first taste of the dirt, which we would get much more of in a few days. We were able to bypass the busy city while taking the car into its element. This Peruvian flavor of dirt was pretty good, despite being washboarded in places and extremely difficult to navigate at night. Climbing back into the mountains had the added bonus of making the car run happier, too. We slept by the side of the road near Huambo, a tiny village near the apex of this dirt detour. 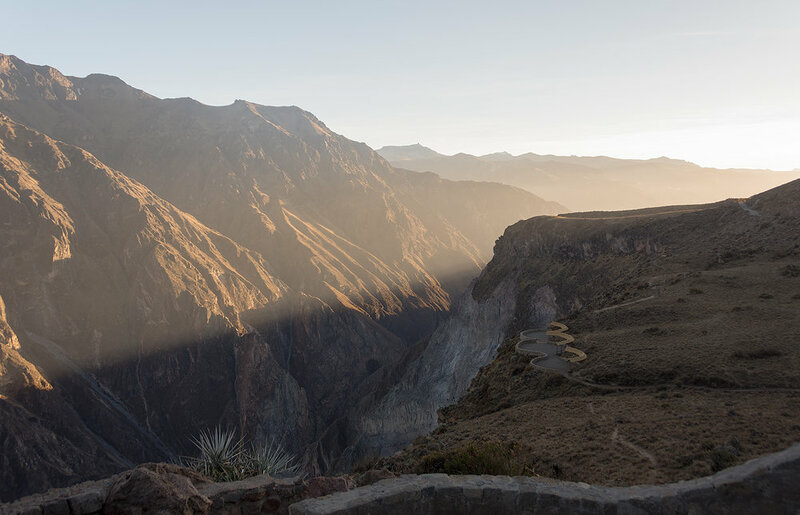 Just after sunrise, we started paralleling the Colca river. We didn’t see Cañon del Colca up close (a major tourist attraction), but we at least got a good idea of the surrounding landscape. The sun was angled almost exactly with the valley, leading to some challenging (but rewarding) scenes. The light was a bit easier in the other direction. Just beyond the north side of the valley (close to the snow caps in this picture) is the source of the Amazon River. At this point we were less than 30 miles away from the start of the largest river in the world. Since we were back on a tourist route (buses take the northern part of our detour to get to the canyon), the rest areas began to become quite nice. I really liked this one, which had pottery and straw roofs. If we knew these were here before the previous night, we might have had a chance to sleep in a slightly nicer spot, but in the end it wasn’t a big deal. 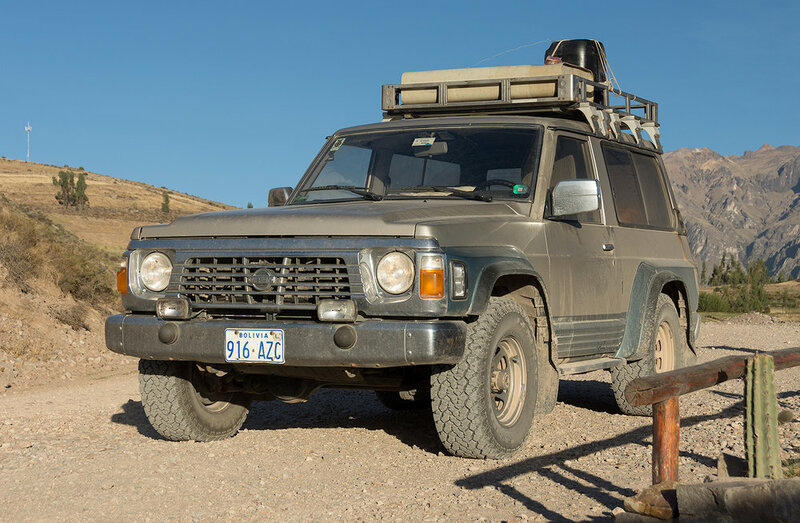 Here’s our noble steed, the 1995 Nissan Patrol, specifically the short wheel base 4x4 model. We were finally in its element. You can see the two extra fuel tanks, which would come in handy (but not here). After trouble in the previous days, both due to the dodgy oil pressure gauge and the lower elevation, things were going much more smoothly now. At this moment, we were finally getting a good idea of why we went in this direction. Yes, yes it is. That mountain is an active volcano, doing active volcano things. Specifically, it is the volcano Sabancaya, which has erupted several times in recent decades. According to Wikipedia, it is one of the most hazardous volcanoes in Peru, due to the frequent eruptions and the high population living in its proximity. At this point, Sabancaya was just venting sulfur and ash and it has since quieted down. Even though this was a minor bit of activity, it was still incredible to see a volcano “up close” (actually 20 miles away). This wasn’t the first time Jake and I have seen the results of volcanic activity, having gone to Yellowstone and the geysers of Iceland previously, but none of it has been quite like this. It was spectacular. After taking a look at the volcanoes, we started descending through towards Arequipa. There are two roads into the city from the north. One is a paved road, going around a mountain range. The other is a dirt road, splitting between two more volcanoes. We picked the volcano road. This is a closer view of Misti, this time from the north. 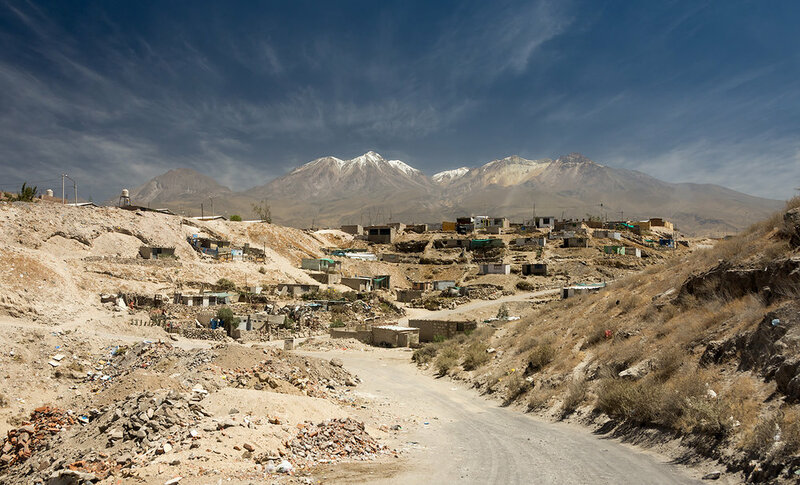 Misti is famous because it provides a stunning backdrop to Arequipa, Peru’s second-most populous city. This photo shows its prominence from a different angle. Misti is extremely dangerous, since nearly a million people live in its shadow. 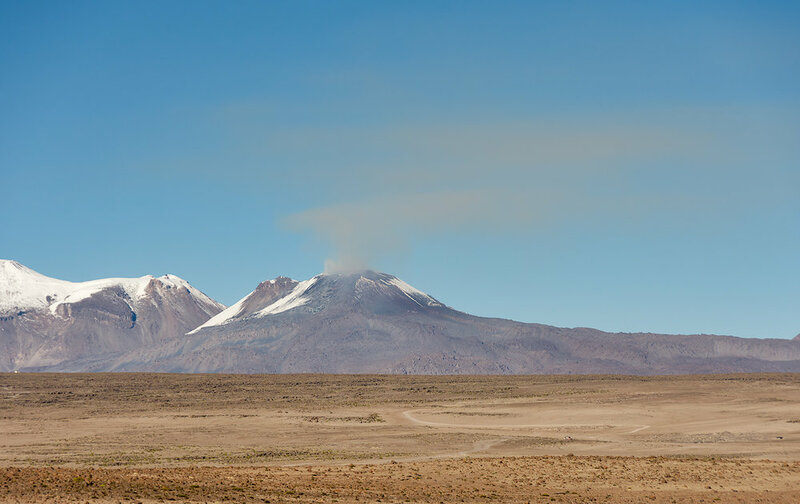 It has not erupted since the 15th century, but Peruvian scientists have recently warned that it is potentially showing signs of renewed eruptive activity. This series of peaks is called Nevado Chachani, the highest peak near Arequipa. Climbing to the summit (just under 20000 feet) is a popular tourist attraction, since it’s easier than most other mountains in this area, particularly when acclimated. Chachani is also a volcano, though it has been dormant for a very long time. This foreground in this photo reminds me a lot of the Mojave desert in California. The painted hills in the background are obviously different, but it’s funny how vastly different geological areas can trigger memories of more familiar environments. At this point, we reached the northern outskirts of Arequipa. I’ve heard a lot of good things about the city, but unfortunately we didn’t have any spare time to spend here. This photo is a bit misleading towards the overall economic condition of the city, which is better than these shacks located on the outer edge of town. One thing that this photo is not misleading about, though, is Peru’s trash problem. I’ve done my best to photograph around it, but it’s absolutely worth noting. There is litter everywhere, especially in more populous areas. It’s pretty sad that a country with so much incredible natural beauty isn’t taking better care of said natural beauty. Hopefully this improves with time. Having successfully navigated the northern outskirts of Arequipa without too much traffic trouble, we one again returned to the north on the paved road we bypassed earlier, closing the loop on the map at the top of this post. This also resulted in rejoining the truck route. 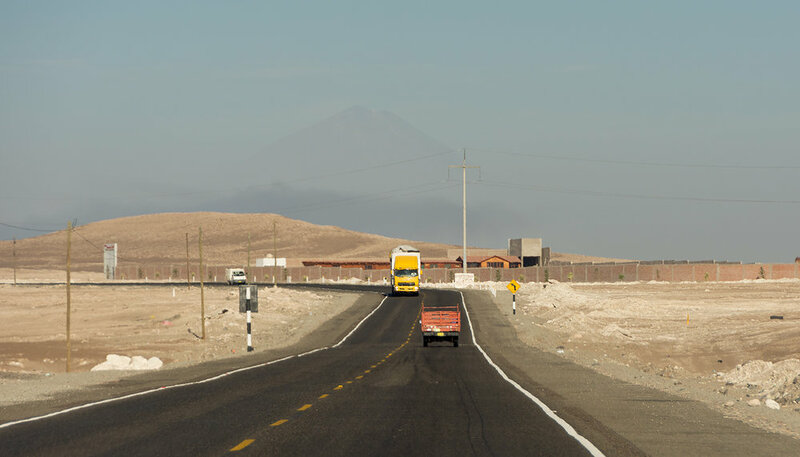 This road is not technically the main branch of the Pan-American Highway, but it is considered a part of a spur route which connects Lima and points northward with La Paz in Bolivia before continuing to Paraguay and Brazil. The road northward gave us another view of Sabancaya, this time from the south. This (frankly awful) picture was taken out of the side window of our still-moving car. In Peru, car modification is extremely common. If you scroll up, you can see it on the tuk-tuks, but car modification culture extends beyond that. Passenger cars are often kitted with LEDs (mostly blue, which is alarming for a tourist from a country where blue lights on the road means police). Trucks will often have some sort of mural painted on the cab, none better than this one which is incredible. 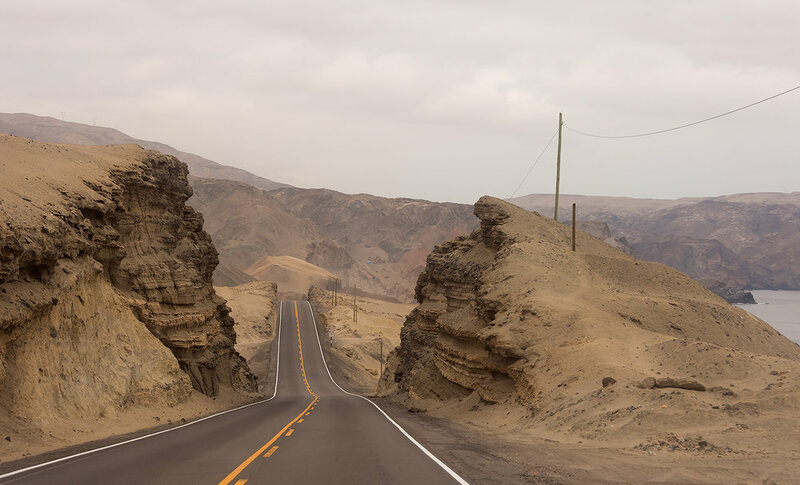 This portion of the road to Bolivia passes through some of Peru’s high desert. In many places the mountains faded towards the horizons, replaced by vicuña and sagebrush. The desert landscape was peppered with small lakes, like this one. The birds in the water are wild flamingos. We didn’t stop to get close-ups this time, but we got good pictures later in the trip. A typical view of the highlands. This stretch of road mostly remained over 13000 feet. 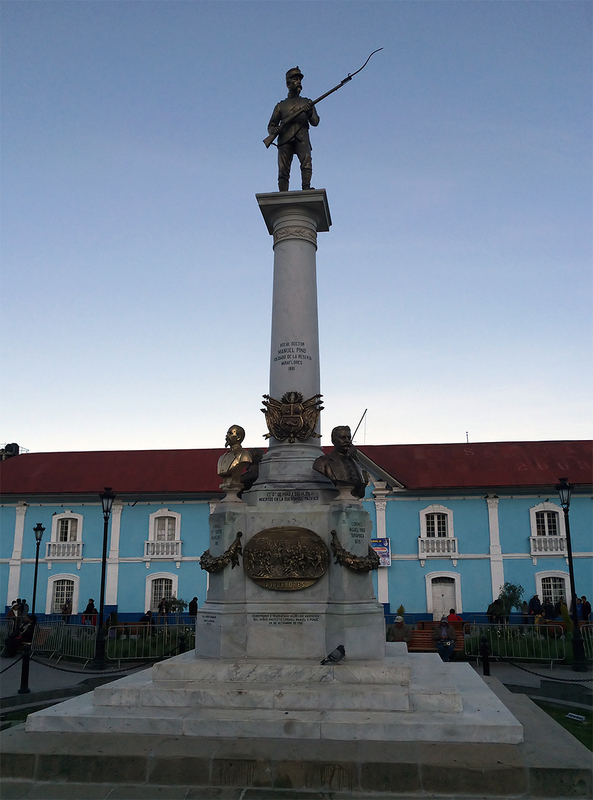 Juliaca is where we rejoined ruta 3S and turned southwards towards the border. 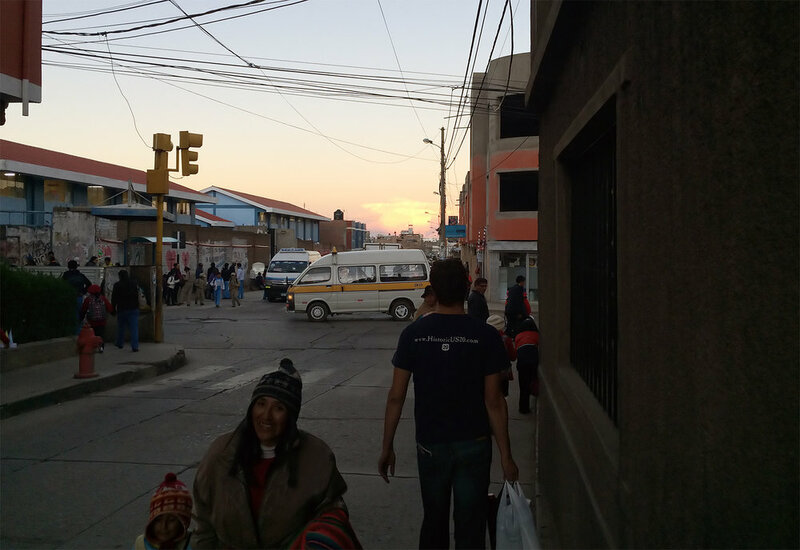 Juliaca is a typical mid-sized Peruvian city, filled with taxis, tuk-tuks, and pedestrians. Driving through it was frenetic, like it was in most cities of the country. I don’t know anything about Romulo Mucho’s presidential platform, but I do know that his name is excellent. We stopped for the night in the city of Puno, famous for being Peru’s gateway to Lake Titicaca. This stop was critical for us because we had some errands to run (specifically, I was out of clean clothes and needed to do laundry). It also let us shower following our night sleeping in the car and the dusty day of driving. Uncharacteristically for us, it also left us with time to wander around the city. Below are a series of photos taken from Puno, all using my iPhone. I’m pretty impressed by the general level of competence of that phone’s camera. 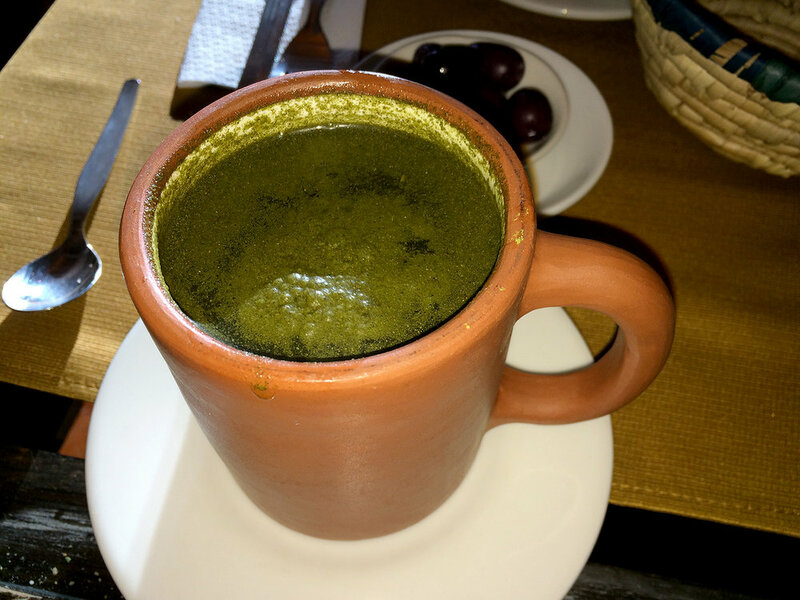 As an aside, I have no idea what is in that evil green beverage (it’s not alcoholic) but I do know that it made me pretty sick. Jake had two of them and he was fine, so I guess your mileage may vary. Before crossing into Bolivia at Desaguadero the next day, we had a simple 90 mile drive along ruta 3S. The road is nice, paved, and occasionally offered good views of Lake Titicaca and the mountains beyond. We decided to cross in Desaguadero instead of the more famous crossing in Copacabana because Jake had already crossed here about a week prior. We had hoped that his familiarity would help expedite the process of crossing the border. It didn’t. The layout here is very counter-intuitive. After getting lost and accidentally driving through a pedestrian market, we ended up at the truck crossing. We spent some time trying to cross in the wrong place, before needing to drive back into the town itself. The town was having some sort of market day and was quite crowded, which didn’t help matters. After quite a lot of time asking for directions, we worked out that we needed to get our paperwork done at the pedestrian crossing (including getting stamped into Bolivia and officially importing our car). We were then to walk back to the car (parked in Peru), then drive across the border at the truck crossing’s bridge. These two are iPhone photos. The first is Jake leading us out of Peru and into Bolivia. The second is looking out on the bridge between the two countries, over the southern reaches of Lake Titicaca. Nearly five hours after reaching Desaguadero, our paperwork was done. It was time to cross the truck bridge, saying goodbye to Peru over the famous lake. Thus ended the nine days I had in Peru. I absolutely loved it there. In my mind, you can measure the quality of a destination by how much you want to go back after you leave. I’m already trying to figure out how to squeeze in another trip to Peru. I want to go back to Cusco, I want to spend time in Arequipa, and I want to see the spectacular mountains of Huascarán which we missed this time around. I can certainly see myself returning there at some point in the next five years. However, it was time to look forward, not back. We still had another eleven days on the road, with all of Bolivia stretching before us. The most spectacular scenery was yet to come.